Our slips are supported by 100% floatation, and they are based upon our own, reinforced steel design. Combined with a comfortable wood deck, these docks provide a solid and stable system. Because the slips float on the surface of the water, you can securely tie your boat once, and know that tides, river fluctuations, and other changes in water level wil not impact your boat. We offer approximately 140 slips ranging from 24 feet long to more than 60 feet long. Approximately 85% of our slips are 32 feet long or longer. Even more impressively, most of the dock wells are 32 feet wide, providing plenty of space between you and your neighbors. As shown on our rates page, seasonal prices for boats measuring 25 feet long or longer include water and 30 amp power service. Boats requiring dual 30 amp service or 50 amp service can also find a comfortable fit in our slips. Extra power (dual 30 amp or 50amp) is available for an extra charge of $2.50 per foot for the season. 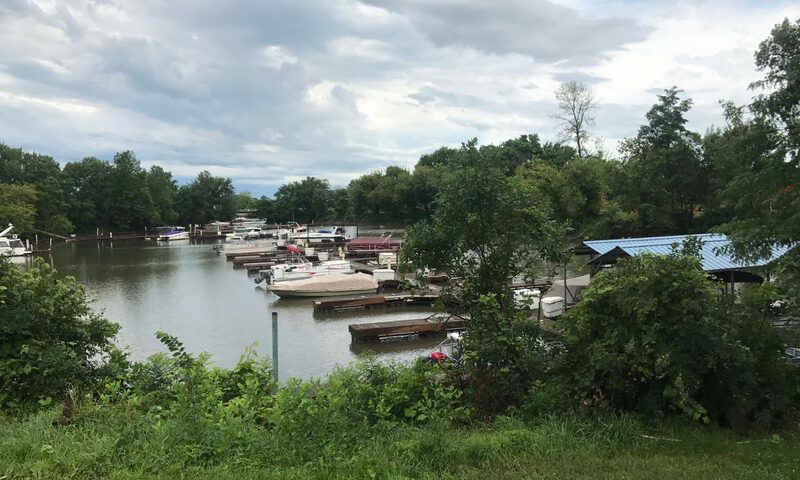 As you can see in the photo, our marina enjoys treelined shores, premium, luxurious docks, and a sense of community shared by long time and competent boaters. Send us an email or call us to reserve a slip. 630-330-3777.